In brief: Remember back in 2017 when reports of PC Building Simulator first arrived? Following a lengthy period in Early Access, the game where you put together a virtual computer much like you would in real life now has a full release. The finished product launches alongside a partnership with Nvidia, meaning you can use some of the green team’s top graphics cards in your builds. 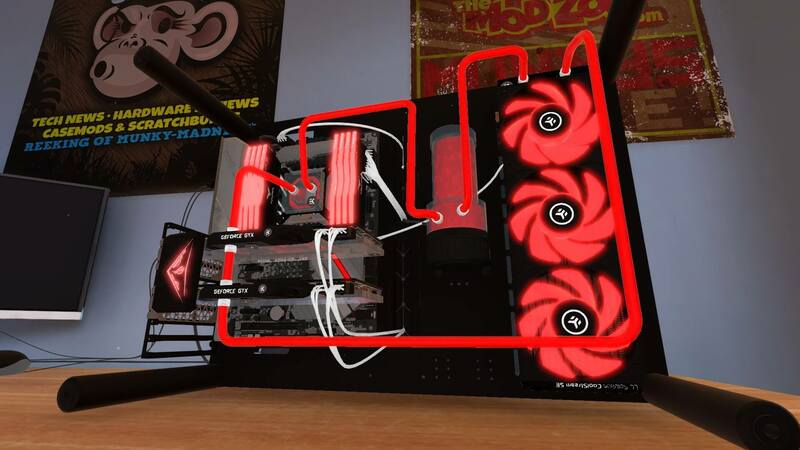 While most readers of this site will likely find PC building a breeze, the program isn’t just for teaching novices the ropes without putting their pricey hardware at risk. It also includes a virtual PC building and repair business sim, where you perform upgrades, repairs, and complete system builds for customers. The game contains numerous licensed components from real-world manufacturers. The full release adds parts from Nvidia, so you can include Founders Editions of the GTX 10 Series and RTX 20 Series in your builds, which might be the only way some of us will ever put together a PC with an RTX 2080 Ti inside it. An impressive element of the game is that once you’ve finished your computer, you can run a simulation of 3D Mark. If you’re impressed by the approximate benchmarks, you might be more encouraged to go out and buy the real parts. PC Building Simulator is available on Steam now for $17.99. It’s a sale price, so grab it before February 5 when it goes up to $19.99. The slightly more expensive Overclocked Edition ($22.98 / $24.98) includes some custom cases. For those interested, here’s a full list of the game’s partners.